It’s been a while since their smash-hit album from 2002, and that one is actually still riding high on the charts (#17 Amazon). I personally can’t judge that album (Songs About Jane), since over-airplay works as a deterrent for me (This Love & She Will Be Loved). I do know it was a fusion of Pop, Rock and R&B. But most will hear a definite shift in gears with their new single (Make Me Wonder), being more funky than ever. And the album, while still fusing more styles, is funk-based. It’s up-tempo groovy happiness, but somehow I never seem to catch the wave, and so I can’t be really positive about this album. Of it, I can appreciate a few easy-listening tracks, but that as far as it goes. I guess it’s just not catchy enough.6-. Pirates of the Caribbean: At World’s End manages to break its own record, opening with $139.8 million (against $135 million of last year’s Dead Man’s Chest), but fails to overpower Spidey’s $155 million opening. At two, Shrek the Third drops a heavy 56%, with $67 million in its second week. Total now stands at $217 million while Shrek 2 managed $260 million in the same week. At three, swinging just a tad more slowly is Spidey with $18.1 million. New comers round out the top 5, Ashley Judd starrer Bug opens with $4.02 million, while fourth week release (but first week wide) Keri Russell starrer Waitress earns a $4.01 million tip. Interesting movie and a very personal view on how the “authorised” biography of Howard Hughes came to life. On most levels it’s equivalent to 2003’s Shattered Glass, both where you can see how one lie can be a fertile ground for manymore. Both have overall good acting involved, and the story is engaging because of how the lies are perceived and how it evolves. But unlike the dark and moody Shattered Glass, there seems to be an subdued but always present light-heartedness to this movie.7Â½. The pirates are showing their age, and they’re definitely getting tired. Like the last one, it was less sea-worthy (yet managing to break box office records for opening, and total), but there’s more. There’s still nothing really going on with the characters, with less than a handful of meaningful dialogues. The rest gets mixed in with the story, which is utter chaos. Inside the chaos, there’s the occasional backroom backstabbing dealmaking, supposedly to make the story more interesting. But there’s really nothing new to tell. But the worst part is, there’s nothing new to show as well. Had we new creatures and ships in the last one, it’s all aboout the same here. Had the last one a few nicely executed stunts, it’s all the same here. That leaves you only with the quick jokes and the need for closure, and that’s really not a lot.6. Another chapter of The Dangerous Belgian Bought, Swiss Made Utensil story. 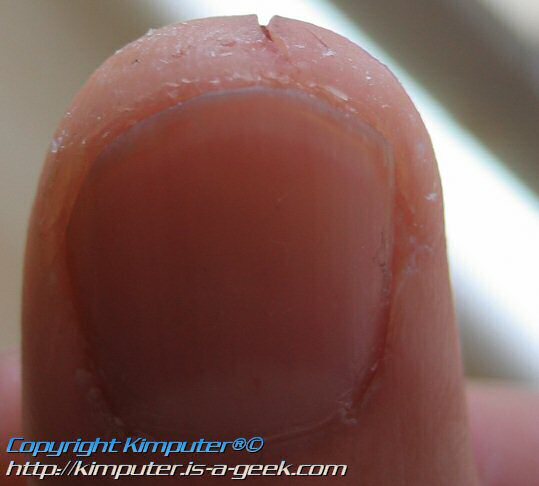 Unlike last time, which was a slice of meat from my left index finger, this time it’s a deep cut in my right thumb. That’s mainly because even though it’s just a utensil, it’s so sharp, I use it to chop everything, from meat to veggies, to wood, concrete, hardened steel and industrial diamonds. Apparently, I keep forgetting the “AWAY” part of the chopping motion. Time to up my life insurance level. Magnum Ecuador Dark: The usual Magnum (vanilla ice cream), with only the jacket made from pure chocolat (67% cacao). To be honest, it doesn’t taste that pure, and the difference with the regular Magnum is not distinct enough. That being said, of course the regular Magnum is no treat I’m saying no to.7Â½. Magnum Colombia Aroma: This is a coffee flavored Magnum, both jacket (crunchy caramel sugar bits in the coating) and ice cream have it. The flavor is strong enough, but it’s not really new. This was actually already done in 2005, from the 5 Senses series, then also named Aroma, ‘cept the crunched coffee beans in the coating have been replaced with the sugar bits. And that’s actually an improvement (more tasteful). For coffee lovers, this will give you the caffeine rush in ice cream format.8Â½. 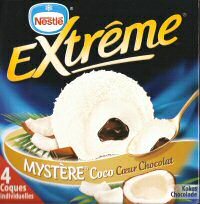 NestlÃ© ExtrÃªme MYSTÃˆRE Coco CÅ“ur Chocolat: As the name might suggest, it’s probably imported from France, as any Dutch scribings are minimal and mostly focuses on the packaging (actually saying the carton box is easy to open !). 4 Individual packaged dessert sized ice cream scoops, the picture looks more mouth watering than the real deal does. This one, translated is ice cream with a coconut scrapings jacket and chocolat core. There’s no contrast in texture, as the coconut is soft, and the ice cream can be considered too milky. The chocolat used inside is a watery sugar mix, and doesn’t do real chocolat justice. While not gag-inducing, it’s probably not something you should buy because of the enticing package. Better get yourself the familiar Bounty Ice Cream instead.5Â½. 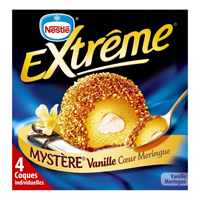 NestlÃ© ExtrÃªme MYSTÃˆRE Vanille CÅ“ur Meringue: As with above, the colors on the package have been highly distorted to make you wanna try this, but in this case, I don’t mind. The vanilla ice cream is really extremely vanilla flavored, and the meringue core (basically, sugar, AGAIN, but in another form) and sugary nut crisp (the one also used on the side of cakes) is sweet enough to induce a diabetes attack. This is truly for the people with a sweet tooth the size of a basket ball (me !). The combination though, makes it a bit addictive, so better keep a few insuline shot at hand.9-. After 3 weeks, a more muscular creatures bumps the spider off the top. While Shrek the Third breaks its own record, $122 million in its first week, it doesn’t beat the $151 million Spidey took in earlier this month. With no other adversaries, Spidey hangs on at the runner-up spot, with another $28.5 million. While breaking the all time opening record, the total ($281.9 million) is already behind the tally of the previous Spideys in their third week (resp. $285.6 million and $302.3 million). Trend these days are bigger openings, but higher fall-off rates, resulting in a lower total in the end. Rounding out the top 5 is 28 Weeks Later with $5.2 million, Disturbia with $3.7 million and Georgia Rules with $3.5 million. We finally have a weapon in hand, we can fight back. Years of deception from the female crowd with their push-up wonderbra’s. All men click here and order your retaliation ! People usually don’t line up for a serious Jim Carrey movie, but for once, they were right. Then there’s the film noir aspect of this movie (while actually still filmed in color), which I usually don’t like either. As a thriller, it’s all just too far-fetched to even entertain the remote possibilities of what’s going on, plus the whole continuous reliance on the nightmare effect is a putdown again. The more reality bound ending makes up for just a bit for that, but overall, it’s slightly leaning to being boring.6-. Ol’ fashioned thriller with bits of courtroom drama. This time it’s Ryan Gosling facing a formidable opponent in the latently menacing Anthony Hopkins. Ryan holds up quite well, already proven his acting qualities in last year’s indie drama Half Nelson. Thriller-wise, it’s not really personal, yet engaging nonetheless. Story seems pretty smart, but when you really think about it, it’s doesn’t have a full body, rather focusing on one or two elements throughout the movie. While I figured out most plot points halfway through, it’s wrapped up nicely enough with the few story points, and sometimes funny dialogue.7Â½. A very able cultural light family drama that tells a story of a man from India and his life after moving to the States. You’ll get a bit of insight in their customs and values, but luckily that’s not the main intent of the story. Without the forced perspective so many of these movies have, the cultural and generation gaps take a subtle backseat, and strangely, a single name acts as the strand of the story. While I’m always extra weary when it comes to foreign movies (in this case, only half of it is), the acting seems to be the strenght of this movie.7+. Can’t say I’ve ever been impressed enough to listen to a whole CD by them, but I thought, after they’ve been building their radio friendly image, I just might digest full album after all. Sure I know their pop-rock-rap hits, highly infective, but that only last a few minutes. Then there’s the really heavy stuff, which I really can’t stomach. And this album has a few of those distorded big’ol-yellers. The rock-rap part however, has been diminished to less than a handful. Newly introduced are a few slower songs, all of them failing to grip you. All in all, it lacks melodic punch. A few do have some kind of build-up, but in the end they never deliver. Of course, when you enter the music world with a signature song like In The End, all songs following it will resemble it too closely or they’re just too different. After 7 years, they still can’t completely shake that off.5. Spidey is still swinging at the top for another week. With a considerable drop (60%), it still has a more than comfortable lead on the rest with $60 million. Not even close behind is 28 Weeks Later with $10 million. It’s a sequel to 28 Days Later, though having no stars, writers, directors from the first low budget sleeper hit. Georgia Rule ends up at number 3, with $5.9 million. Drama/comedy is Jane Fonda’s second movie since her decade and a half long retirement (after Monster-in-Law), and also stars Lindsay Lohan. Disturbia drops to number 4 in its fifth week with $4.8 million. Rounding out the top 5 is the unanimously (critics and viewers alike) voted bomb of the week, Delta Farce, a supposedly comedy, with $3.5 million. Again, not really my desk. It’s kitchen window, where I planted a four leaf clover seed a few months ago (got them for free at a supermarket for their healthy food initiative). And then after all that dormant time, it pops up and outgrows the two bonzais in mere 2 days. Well, that’s not healthy I tell ya. That’s unnaturally abnormally genetically enhanced unhealthy, to be exact. Religious scare, a God or Satan fearing flick. Yeah. Not Really. Nothing actually scared me ever since The Excorcist, and this one just tips the plate, nothing more. Instead of REAL scare, you will get countless hallucination sequences (which actually numbs you further and further), and for the rest, special effects will take over. Nothing really crawling under your skin. Having Hilary Swank playing a strong lead makes up for some of it, but there’s only one major plot twist. You’ll just have to do with a strong start, and a downhill trip.6+. 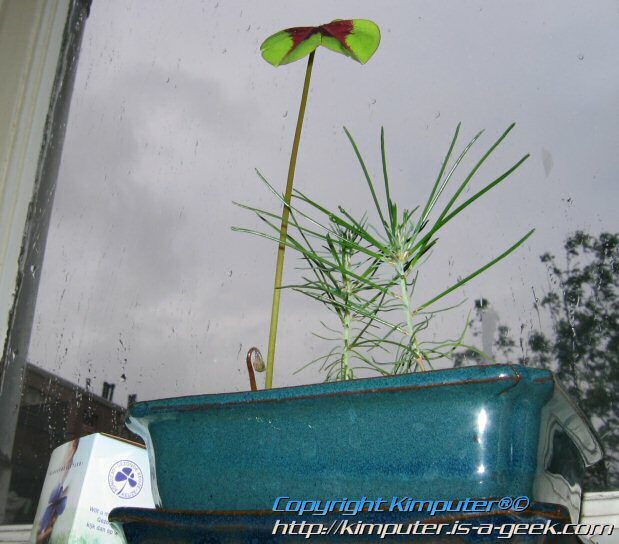 You are currently browsing the Kimputer's Weblog weblog archives for May, 2007.